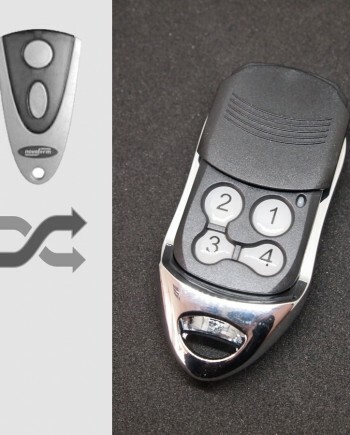 An aftermarket compatible remote, perfectly replaces your plastic BFT remote control, works where BFT MITTO works. Wondering if it works same as BFT MITTO remote? Watch our video showing how we program it to BFT standalone receiver. 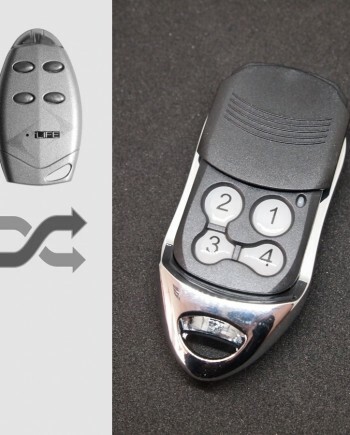 Our BFT #B1 compatible remote replaces many BFT remote control models including genuine BFT MITTO 2M key fob remotes, as well as other BFT remote models such as MITTO 4M, MITTO 2A, MITTO 4A, MITTO B RCB02 R1, MITTO B RCB02 R2, MITTO B RCB02 R3, MITTO B RCB04 R1, MITTO B RCB04 R2, MITTO B RCB04 R3, MITTO B RCB04 R1 Vineyard, MITTO B RCB04 R1 Sunrise, MITTO B RCB04 R1 Clear Ice, MITTO B RCB04 R6 Rainbow, TRC1, TRC2, TRC4, KLEIO B RCA02 R1, KLEIO B RCA04 R1 etc, it also works with BFT radio remote systems using PR2, RB, GHIBLI remote control. Compatible BFT garage door & gate operators includes DEIMOS ULTRA BT A400, A400 V, A600, A600 V, DEIMOS BT A400, A400 V, A600, A600 V, DEIMOS 700, ARES ULTRA BT A1000, A1500, ARES BT A1000, A1000 V, A1500, A1500 V, ARES 1000, 1000 V, 1500, 1500 V, ICARO N F, N F V, TR3500 TRI 400, TRI 230, OBERON CE slide gate automation systems, PHOBOS BT A25, A40, KUSTOS BT A25, A40, KUSTOS ULTRA BT A25, A40, PHOBOS N BT, VIRGO, IGEA BT, E5 N, ELI 250 N BT, ELI 250 N swing gates electromechanical automation systems, BOTTICELLI 2.5, 3.9, EOS 120, ARGO G garage door openers, ORO E, LUX BT 2B, LUX G BT 2B, LUX B, 2B, L, G, FC 2B, GV-2B, GV-R, P7, P4.5, SUB BT, SUB E RH, E LH, G RH, G LH, R RH, R LH, ER RH, ER LH, EL RH, EL LH, RH, LH hydraulic swing gates automation, REEL RUA A10, A20, A30, A50 roller shutter automation systems, ECOSOL BOX solar-powered system, XPASS B 275, B 330, RANCH D 275, PILLAR B 275, RANCH C 275, STOPPY MBB KIT 219, STOPPY B 115, 200, DAMPY B 115, 219, RANCH B 219 rising bollards, MAXIMA ULTRA 35 SM, 68 SM, MAXIMA 30, 60, 80, MICHELANGELO BT A 60 U, 80 U, GIOTTO 30 BT, 30S BT, 60 BT, 60S BT, GIOTTO BT A 30S U, 60S U, 30 U, 60 U, MOOVI 30, 30S, 60, TWIN ON LIGHT, OFF LIGHT road barriers, VISTA SL, VISTA SL C, VISTA TL, VISTA SW, PRV20, PRV40 automatic pedestrian doors, WIND RM roll-up door automations, ARGO, PEGASO B CJA, FORB sectional and folding door operators as well as other standalone receivers made by BFT. Not compatible with some other BFT remote control models using old 30.875 MHz frequency, such as TO1, TO2, TO4, TFQ1, TFQ2, TFQ4, TZM2, TX1 30.875MHz BLUE, TX3 30.875MHz BLUE, or 224.5 MHz ones such as TX1F, TX2F, TX4F, or 272MHz ones such as TM1, TM2, or 306MHz ones such as TX1 306MHz and TX2 306MHz, as well as 315MHz ones, such as VTM1, VTM2 and VTM4. BFT remote controls are made by BFT, a market leader for automation systems founded in 1981 in Thiene, with the vocation being available to customers at all times, oriented towards those who work with BFT products, a spirit that immediately allowed them to win the loyalty of those working in the installation and automation world. Today BFT operates all over the world, with 20 branches and over 530 distributors in more than 120 countries. 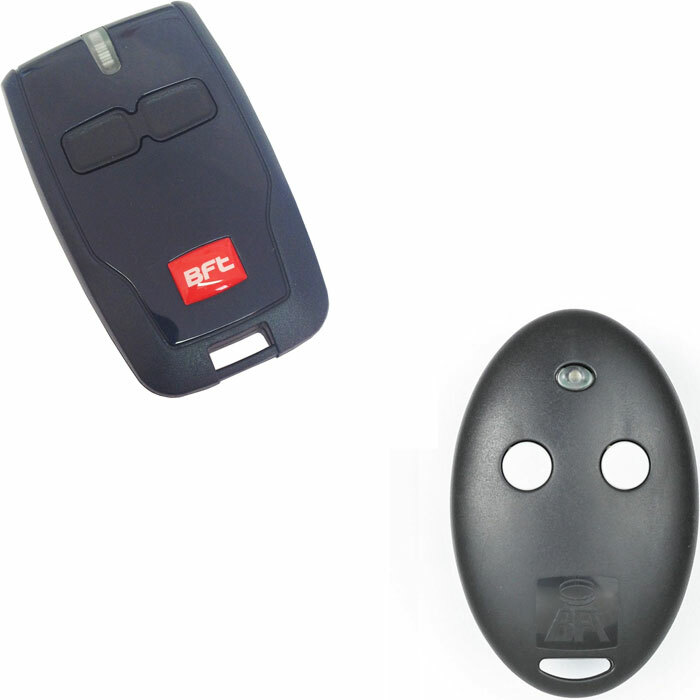 Based on our marketing research, the best-selling BFT remote control models BFT MITTO 2M and newer case compatible BFT MITTO B RCB02 since BFT introduced rolling code in the year 1999. 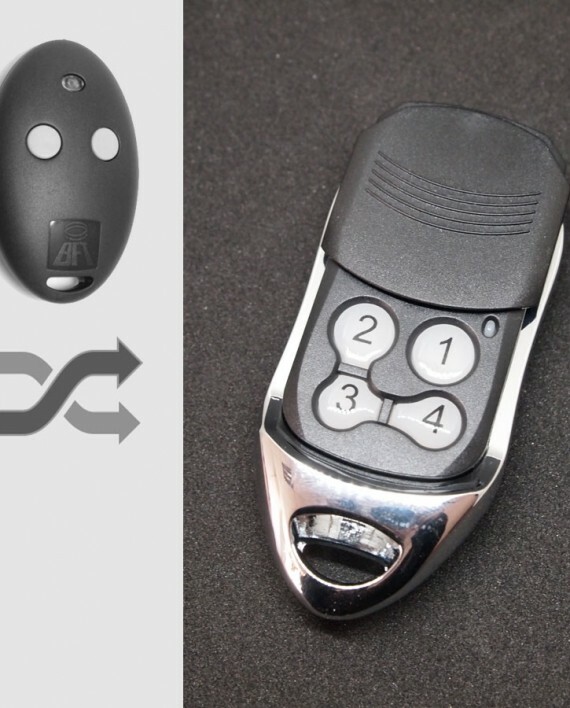 BFT MITTO 2M and B RCB 02 is a two channel remote control key fob for pretty much all current BFT automation systems including slide gate, swing gate, garage door opener, roll-up door and others. 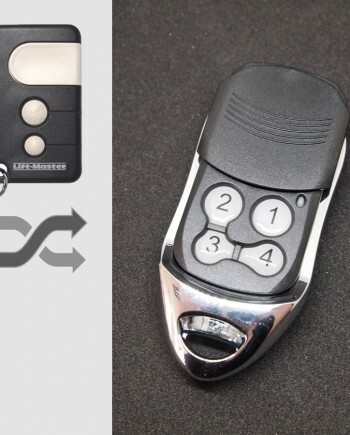 The remote control features 433 MHz rolling code with optional block management feature, and the four button version hand transmitter MITTO 4M and B RCB 04 can control one door plus 3 other optional systems. BFT MITTO switched to new case two years ago and the old round case MITTO 2M is fully compatible with newer rectangluar case MITTO B RCB 02 remote, they all controls almost all current BFT automation systems. 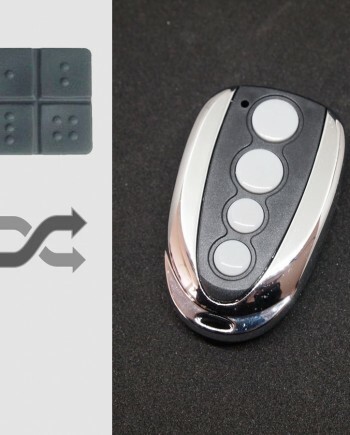 BFT brand remotes are widely used in European countries, such as France, Turkey, Belgium, Portugal, Spain, UK and Germany, so there are many locksmiths, garage door opener & gate remote dealers need BFT remote controls in this region. Official BFT MITTO remote control programming guide is missing on BFT website, you can find it on your BFT door opener’s owner book, link to 3rd party manual is here. Watch programming video for BFT MITTO on YouTube, our replacement remote works the same as genuine BFT remotes, so they share the same programming procedure. We make BFT MITTO compatible remote in our factory in China, so we know our products better than anyone else in the world. 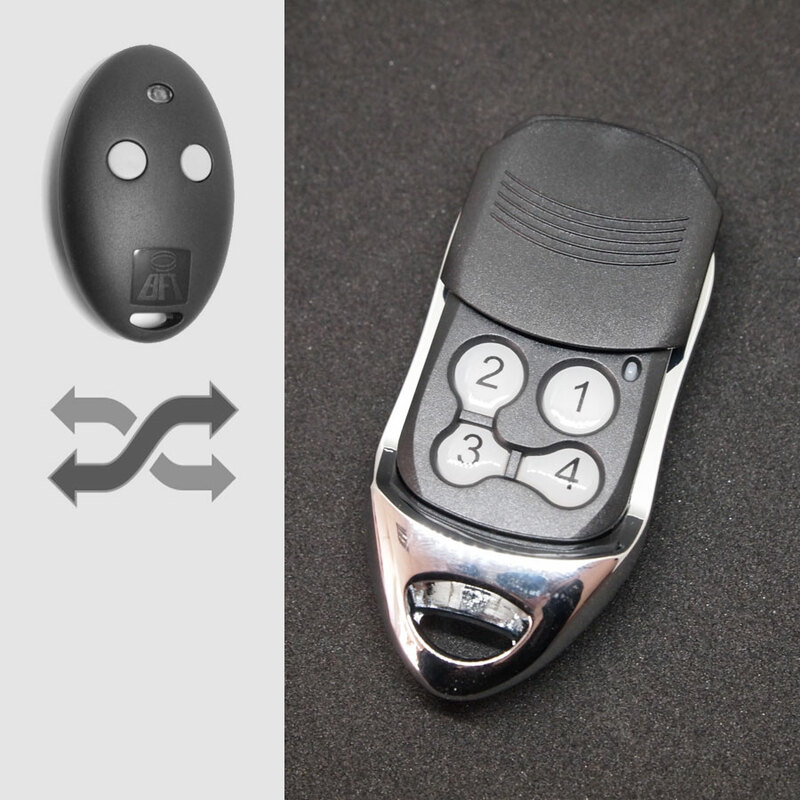 We’re confident in our engineering team & quality control, actually our BFT compatible remote uses the same key components as genuine ones. 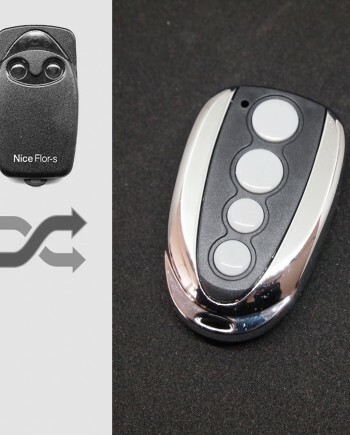 Comparing our factory-direct low price with high price of genuine BFT remote, you can have considerable profit by selling our products. * Our BFT compatible remotes are white label products with optional logo printing service for bulk orders.